Serving up 16 tons of hard hitting music delivered directly to your ear hole. 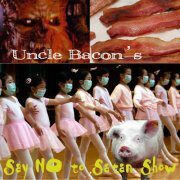 with cosmic-anarchist-cowboy Nazel Pickin's from 7-10pm. Spinnin' the sounds of the West and the rural ways! Nazel is unbashfully country, but don't look for Toby Keith or Shania Twain 'round here. From classic country (up 'til the '80s somewhere) and western-swing, to bluegrass and old-time, to traditional and mountain music, to folk and singer-songwriter, to indie-roots and alt. country, Mr. Pickin's mixes it up and translates it through his own confusion. Adding ample commentary to the music and to livin' in general, don't take him too personally, he just drinks too much coffee. with DJ Ol' Dirty Pastor from 10pm-Midnight. ODP lays down the urban vibe with a two-hour treat of the finest hip-hop, rap, samples, and grooves around. Put the kiddies to bed before this one! The Psychedelic show features bands from the 1960's that play the "San Francisco Sound". Starting off the first hour with individual straight ahead songs then playing progressively more extemporaneous improvisational jams, with multi-layered musical collages. Winding up the show with some good ol' fashioned rock n' roll. With Chris P. Baggins as your host. Turn On-Tune In- Rock Out! A hip hop show LEANING towards southern hip hop. Syrupy slow and chopped up. If you've never heard "chopped and screwed", listen to Dj Screw (r.i.p.) or DJ Max. 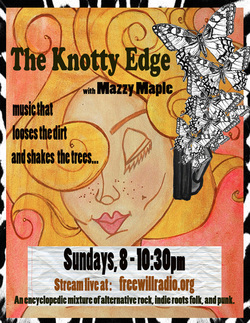 with Mazzy Maple from 8:00 p.m. - 10:30 p.m.
An encyclopedic mixture featuring alternative rock, indie roots folk, punk, and electronic. Music that looses the dirt and shakes the trees. And You! We're always looking for more DJs. If you feel like your tastes are not being satisfied, or you think you got something to say, or just love to hear your voice (projected out loudly to your world), then consider becoming a guest or regular DJ on "Free Will Radio". Also consider donating your music (preferably digital) to our library and playlists, equipment, supplies, time, and, of course, money to keep "Free Will Radio" alive and growing. On any lovely day in between, we are perambulating through our vast library of tunes or featuring guest DJ's from many climes. We welcome new music and fresh energy. Contact us.